A healthy and growing bus system is critical to building a more sustainable transportation network in Chicago. Back on the Bus identifies ways that elected officials and transit agency leaders can improve bus service and reverse the trend of Chicagoans abandoning public transit for less efficient transportation options. While CTA rail ridership has generally grown over the last several years, bus ridership has declined rapidly. From 2015 to 2016, bus ridership in Chicago fell by more than 15 million rides (5.8%), continuing a recent trend of fewer Chicagoans riding the bus. Since 2012, bus ridership has declined in Chicago by more than 17 percent, and it’s dropped by more than 21 percent since pre-recession levels in 2008. Fewer Chicagoans riding the bus means more driving and more cars on our already congested streets. The city’s hub-and-spoke rail system continues to be a good option for people who live and work along the lines and in the Loop, but many neighborhoods lack access to it. Lower quality bus service has major equity impacts. A disproportionate number of bus riders live in low-income communities or work in places that lack access to the rail transit system. Substandard bus service hurts these Chicagoans the most while discouraging higher-income residents otherwise inclined to ride transit from riding the bus more frequently. Without more investment in bus service, Chicago risks more people abandoning transit for transportation options that are more expensive and less efficient, healthy, and green. Faster boarding: Make it easier for riders to pay their fare before boarding and allow riders to enter the bus through the front and rear doors by tapping their transit card. Chicago trails its peer cities in implementation of each of these improvements. 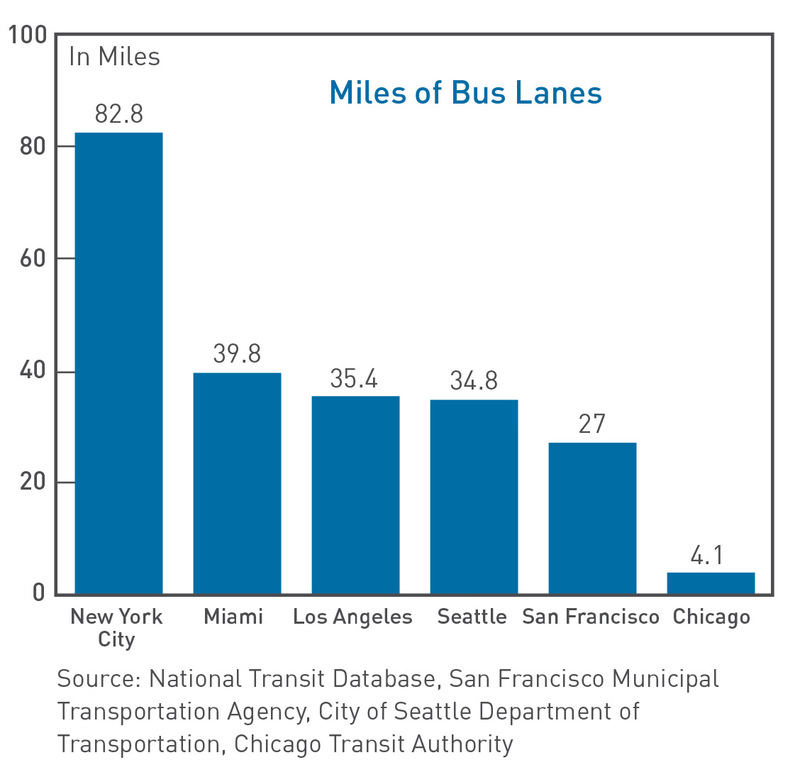 For example, the city has only 4.1 miles of dedicated bus lanes, far less than San Francisco (27 miles), Seattle (34.8 miles), Los Angeles (35.4 miles), Miami (39.8 miles), and New York City (82.8 miles). The recommendations in the report are endorsed by a coalition of community based organizations and non-profit experts. Active Trans’ partners in the Back on the Bus Coalition include: Chaddick Institute for Metropolitan Development at DePaul University, Coalition for a Better Chinese American Community, Environmental Law & Policy Center, Greater Auburn Gresham Development Corporation, Illinois PIRG, Metropolitan Planning Council, Midwest High Speed Rail Association, Shared Use Mobility Center, and Six Corners Association. Active Trans also consulted experts from the Chicago Transit Authority (CTA), Chicago Department of Transportation (CDOT), and the private sector. CTA, CDOT, and other city agencies do not necessarily endorse all of the specific service upgrades and policy actions proposed in the report. Active Trans will work with community partners throughout the city to advocate for implementation of the upgrades and policy recommendations outlined in the report. Working with our partners in the Back on the Bus Coalition, we will continue to meet with elected officials at every level of government to build political will for more investment, innovation, and policy changes on behalf of local bus service. Contact Government Relations Director Kyle Whitehead if your organization is interested in joining the Back on the Bus Coalition and join our advocacy supporter list to get updates on the campaign. This work is funded by TransitCenter, a national foundation dedicated to urban mobility that’s working with organizations in cities across the country to improve bus service, including the Bus Turnaround Coalition in New York City. BRT blog series on projects from across the U.S.